Additional product parameters. Like Size, Colors, etc. Product FieldsР’В is used when you want to add a variations to your product. For now you can add option from Options page or from Product Edit page. Р’В For this in admin panel choose РІР‚СљReady!EcommerceРІР‚Сњ –> РІР‚СљOptionsРІР‚Сњ. Next you must select submenuР’В РІР‚СљProducts FieldsРІР‚Сњ. 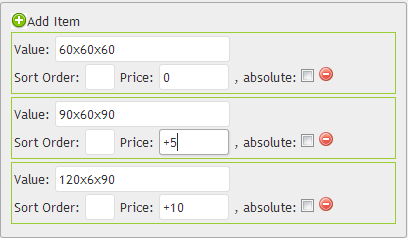 Here we can add parameters. How add size for our product? 1) First of all you should click button РІР‚СљAddРІР‚Сњ. Here you must input values and price. After that select destination.